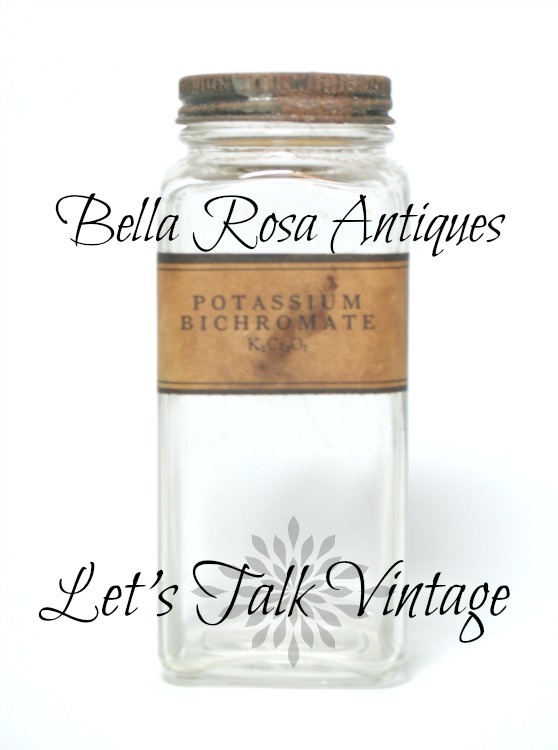 Hello and welcome to Let's Talk Vintage! 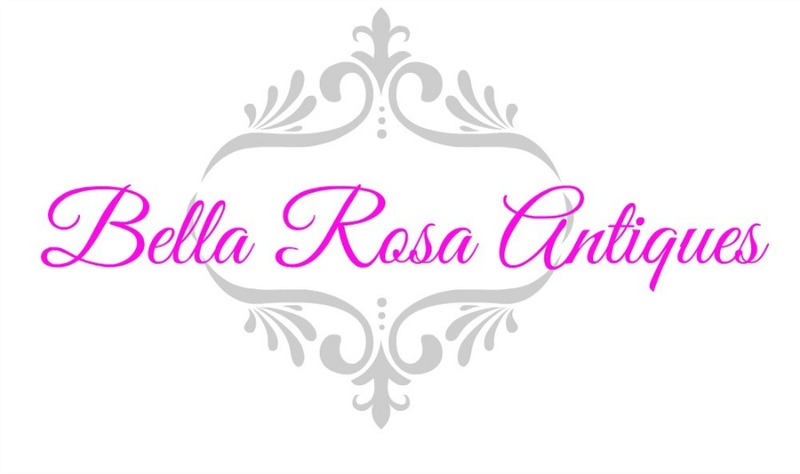 This is where fellow vintage lovers gather together to share our stories, collections, photos, projects, antiques, heirlooms and more. Today I'm sharing a find that I briefly mentioned last week.... these Fire King Glamalite Mugs. To let you know the truth, I almost passed these up at the sale where I found them. I had no idea what they were. I knew by the metal carrier that they were retro / mid century but I didn't know they were Fire King. 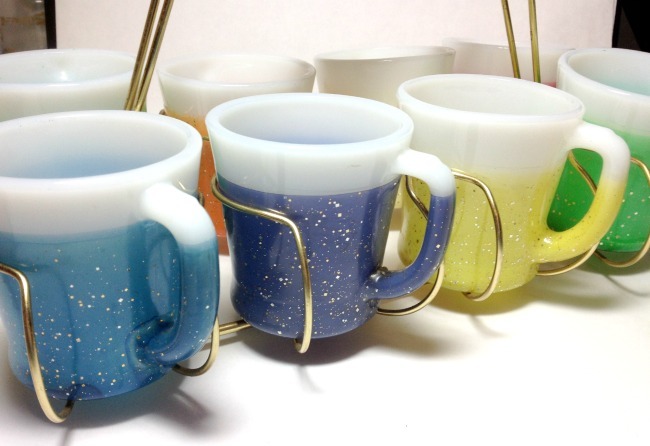 The mugs have a vinyl/rubber coating, with glitter, all around them, except for the top. Thus, the manufacturer's stamp on the bottom would not be visible. 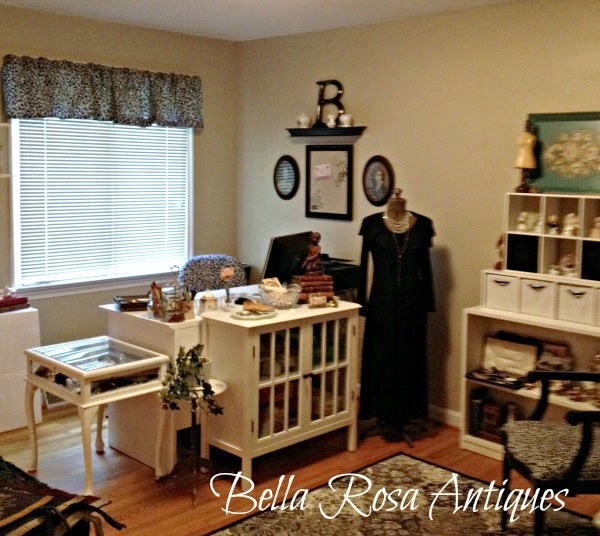 Since I sell vintage retro things in my AntiqueRetroactive shop on Etsy, I decided to buy them and see how they would sell. First, I did a search on Etsy to see if there were any others listed. There were none. Then I tried eBay. BINGO! Turns out they were Fire King "Glamalite" mugs. 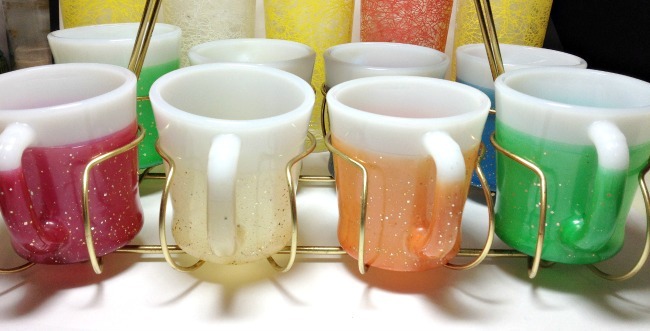 They also make tumblers to match. So, I have them on ebay right now. I hardly ever sell on eBay anymore because of the way the marketplace changed there for antique sellers. The listing ends tomorrow night. I am curious to see how they do! When I showed them on Instagram they were an "Insta-Hit!" I'm even more curious as to why they are such a hit! Maybe it's because I don't drink coffee. Or maybe it is just a rare item, made by Fire King. 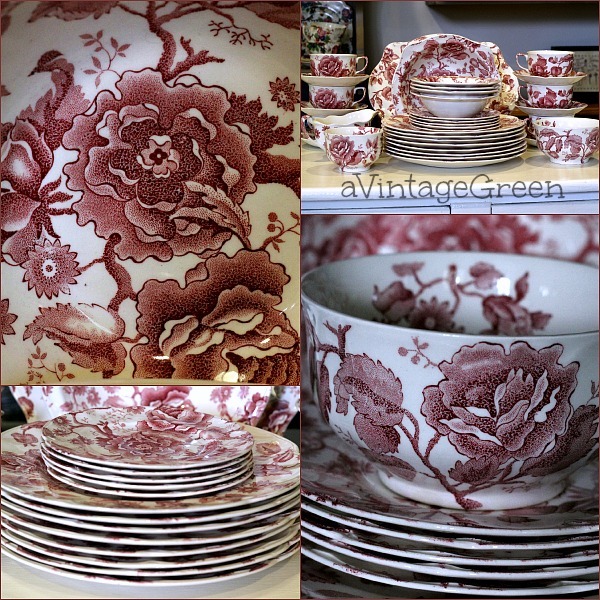 shared this lovely china set. Now it's your turn: Let's Talk Vintage! 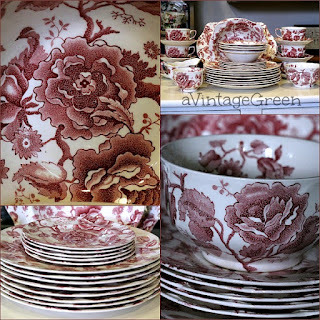 Hi Jillian, thank you for the feature of my rose dishes. Nice surprise. LOVE your fire king mugs in the carrier. Never ever seen those before. Hope they sell right away. Have a great week. love those mugs! I have never seen ones like that!! Hi Jillian! 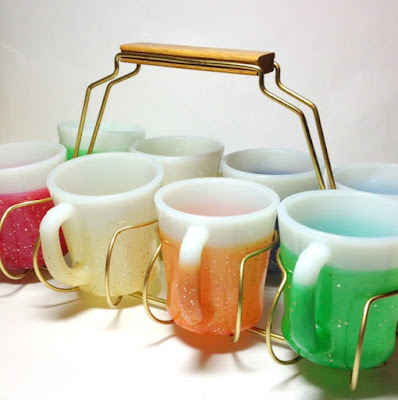 I'm a obsessed with Fire King but have never seen those mugs--great find! Thanks for hosting! 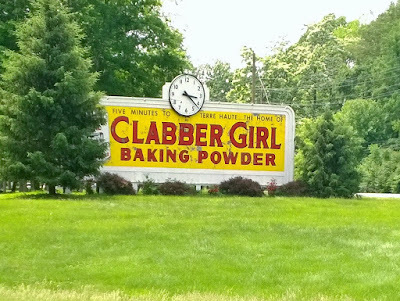 Love that Clabber Girl sign, how cool! Thanks so much for hosting and have a great week! Love those mugs! It always seems that the item I almost don't buy is the first one to sell in my shop! I'm sure someone is going to grab those up! I thought I knew everything about Fire King. LOL!! I have never seen or heard of these. I wonder if they were something that was done to them in the after market. They aren't in my Fire King book by Gene Florence. They are very cool and it will be great to see how high they go! 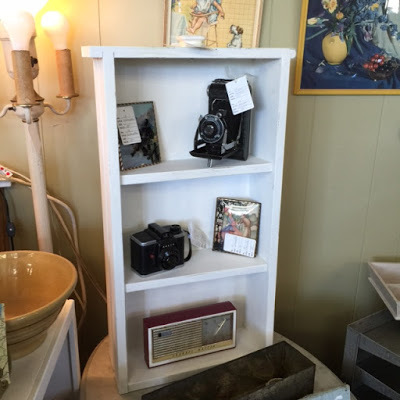 Thank you so much for featuring my drawer made into shelves!! Those are cool mugs! I hope they sell well.....I don't drink coffee either. Hope you're enjoying the first week of summer :) and thanks for the reminder that the link party was ready to go! Yes. And that was a great Clabber Girl sign....gotta love a sign like that. Oh. I. LOVE. those. Mugs!!!!! I've never seen them either and I love when these come with the original carrier! Wow! I just looked at the eBay link-- congrats on a great sale! Wow! Those mugs are awesome! You did well on those. Thanks so much for hosting the party. Oh my word!!! I just saw what these sold for. I'da almost passed on them too cause I don't like retro. Looks like I better reconsider.... Do you see Retro stuff than the cottage/older stuff? just curious... Great for you! 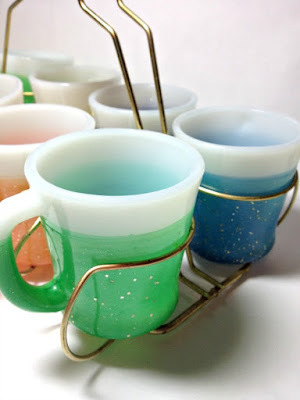 Love the sherbet colors of your mugs. Perfect for enjoying morning coffee out on the patio with a few friends.